For over a year now, we’ve seen many Android HDMI TV Sticks (which I often call mini PCs), a few Linux ones, but Google has just announced its own stick based on a strip down version of Chrome OS. It’s not as versatile as others as it only streams video and music, but it make sharing media easy, and is controlled via your Android or iOS mobile device, or your Windows PC or Mac via Chrome web browser. The connection is just the same as other HDMI dongles. Connect it to the HDMI port of your TV, power it via USB, and setup Wi-Fi. When I first saw the demonstration, I was disappointed as it just seemed like you could do the same thing with a DLNA dongle, but it’s actually quite different. First, Chromekey only works with online services such as YouTube, Netflix, Google Play Movie & TV and Pandora, and it does not rely on your device to send data, but just gets it directly from the original source, potentially providing smoother playback, and avoiding draining your batteries. The device comes with an HDMI extender, a USB power cable, a Power adapter, and requires an 802.11 b/g/n Wi-Fi router to work. You can watch the announcement and demo in the video below. Developer can already use Google Cast API to develop applications both for the receiver (Chromecast) and the Sender (Android/iOs/Chrome). , or Best Buy for $35. If you’ll also get 3-month Netflix service upon purchase of the device ($24), which means if you planned to use Netflix anyway, Chromecast will actually cost you a mere $11. maybe based on this SOC? Check out the hardware internals. It is running a Marvell ARM (dual core?) processor with 2GB flash & 512MB RAM. Running a variant of ChromeOS but expect to see hacked builds due to wide availability and presumable good quality control of hardware. Sadly “Chromecast is not available in your country” so I can’t begin tinkering with it! Thanks, you guys are amazing! No other technical details have been provided yet. DREIPRODUKTE » Google Chromecast – für 35 USD wird dein Fernseher schlau! 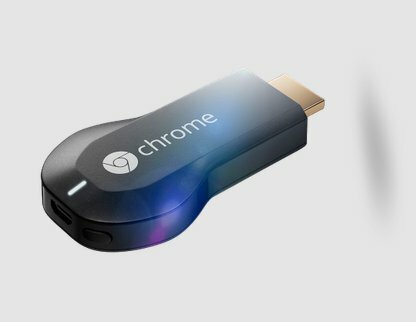 where can i buy this chromecast. is it available online shopping. i am leaving in india.